The Guwahati Water Bodies (Preservation and Conservation) Act Act was enacted in 2008 (amended in May, 2010) as the protection of wetlands was seen as key to control flooding. The Act notified three wetlands – Deepor, Silsako and Borsola-Sorusola. Urban water bodies are important in that they not only act as a reservoir for rainwater run-off but are also a refuge for maigratory and local birds as well as having the potential for becoming eco-tourism parks. The restoration and conservation of these lakes is one of the primary focus areas for the flood mitigation programme under GDD. It is a valuable water body of Guwahati city near Paltan Bazaar. This urban water body or beel was once the habitat for a large number of flora and fauna. It also receives rainwater run-off from nearby hills and other areas. Sola beel comprises two divisions: Barsola and Sarusola. the lakes are shrinking rapidly as a result of encroachment and landfilling. The Sarusola beel serves as a natural stormwater reservoir to the Chandmari, Gandhibasti, Solapar, Ulubari, Manipuribasti, Fancybazar, Panbazar, Paltanbazar, Lakhtokia, Tokobari, AT Road, Satribari and Athgoan areas. Due to encroachment, the beel was blocked which resulted in inundation of large areas with a lower intensity of downpour creating artificial floods in Lakhtokia, Krishnagar, Chatribari areas. The Barsola beel, the largest lake in the city of Guwahati, is also under similar threat. GMDA has taken up restoration by way of desiltation and cleaning of these lakes. It is a fresh water lake (a major area declared as RAMSAR site) in Guwahati and an ecologically important wetland, particularly for various types of species, flora and fauna including visiting lake for numerous migratory birds and a known corridor for wild elephants. Apart from garbage and encroahment, the lake was also being filled with landslides from nearby hills where blasting operation in stone quarries are carried out. 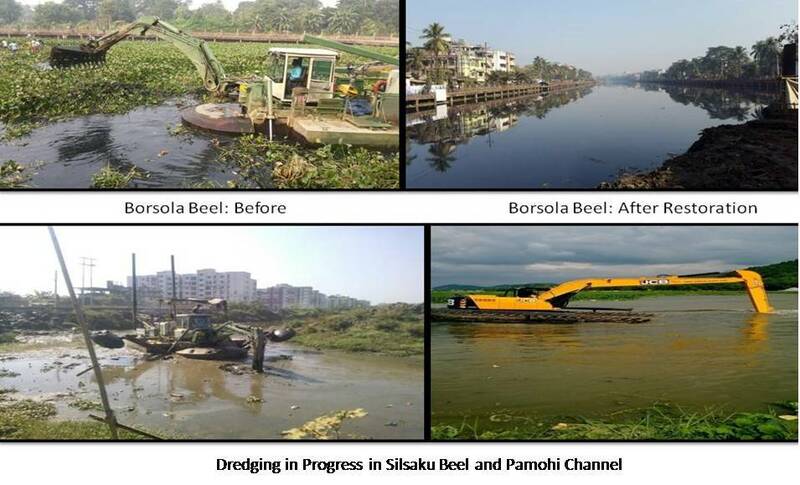 GMDA is restoring the Pamohi waterbody and Channel that leads to this lake along with the NH37 drain by desilting and cleaning in the first phase. It is a large urban water body important for the role it plays as a reservoir basin for the storm water runoff from the nearby hills and Meghalaya. The conservation and restoration of the lake is undertaken by GMDA with the intention to bring people close to nature and to make them understand the importance of nature and to motivate its preservation and the diverse habitat of the aquatic life. Ecologically it is of great significance for an area as they support different food chains and foodweb,recharge ground water, trap solar energy and provide shelter to large number of flora and fauna having ecological and economical value.